Longtime San Antonio Spurs athletic trainer Will Sevening was walking off the Oracle Arena floor toward the visiting locker room in the third quarter when the franchise’s typically quiet star player called for him. Spurs All-Star forward Kawhi Leonard was a couple of feet behind him heading to the locker room for good with a sprained left ankle and needed a shoulder to lean on to finish what suddenly became a very long walk. Leonard described his ankle injury as “very painful” after the Spurs’ 113-111 loss to the Golden State Warriors in Game 1 of the Western Conference Finals on Sunday. The NBA MVP candidate’s status going forward is to be determined for the never-say-die Spurs. The Spurs entered the West finals without their starting point guard Tony Parker. The 16-year NBA veteran was averaging 15.9 points and 57.9 percent from 3-point range in the postseason before suffering a season-ending ruptured left quadriceps tendon on May 3. San Antonio’s hopes of beating the West’s top seed took another hit as Leonard departed with his injury. Leonard missed the Spurs’ series-ending 114-75 victory over the host Houston Rockets in Game 6 of the second round May 11 with the same ankle injury he suffered in Game 5 of that series. Leonard dominated the Warriors in 23 minutes of play Sunday with 26 points, eight rebounds and three assists before departing with his Spurs ahead 78-55. The Warriors responded with an 18-0 run before holding on for the tight victory. Leonard got his left ankle taped in the training room before leaving the locker room after the game. While it sounds odd, such is the norm for an NBA player with a major ankle issue. Leonard walked — emphasis on walked — on the locker room floor around stranded mesh bags of hoop gear, ice bags, ankle-tape cutters, towels and socks while wearing sandals after the ankle taping. It was a bad path for a bad ankle, but Leonard made it to his locker. He is scheduled to receive an MRI on Monday, a team source told The Undefeated. Leonard left open the possibility of playing in Game 2 in Oakland, California. But Spurs coach Gregg Popovich on Monday said Leonard likely will sit out on Tuesday night. Leonard would get five days off if he missed the next game before Game 3 on Saturday in San Antonio. But that’s assuming he would be available. San Antonio Spurs forward Kawhi Leonard reacts after an injury during the third quarter of Game 1 of the Western Conference finals against the Golden State Warriors at Oracle Arena on May 14. The Warriors defeated the Spurs 113-111. “I feel good. I’ll get back healthy. I have faith in my teammates, and we’re going to see what happens in Game 2,” Leonard said. Leonard first reinjured his ankle when he stepped on Spurs teammate David Lee’s foot when the latter was sitting on the bench in the third quarter. 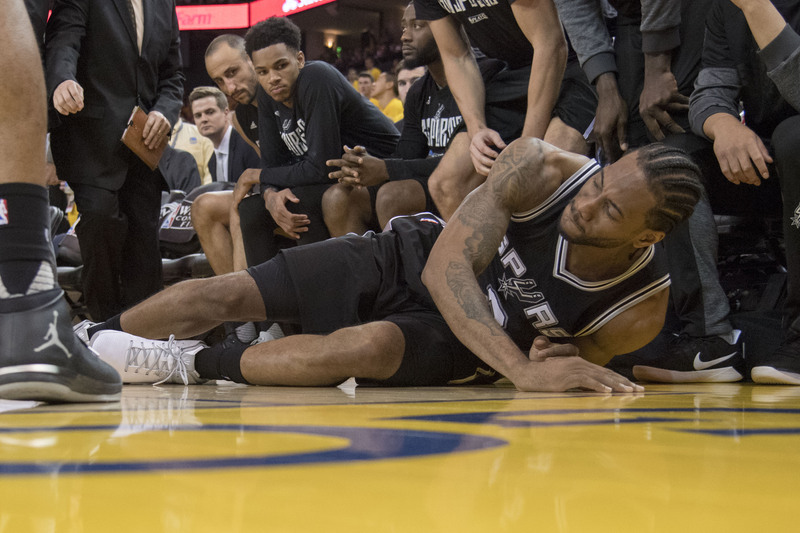 Shortly afterward, Leonard went to the ground in pain as he landed on Warriors center Zaza Pachulia’s foot after a corner jumper with his foot on the 3-point line with 7:55 left in the third quarter. The Twitter world and Spurs fans criticized Pachulia for the foul, but the big man begged to differ. “When you are 6-11 and you play hard, you get blamed for a lot of things,” Pachulia said. Leonard didn’t put the blame on Pachulia. “Did he step under it? Like on purpose? No, he was contesting the shot, the shot clock was coming down. I’ll have to see the play,” Leonard said. If Leonard is out, the fate of the Spurs’ offense will hinge on veteran forward-center LaMarcus Aldridge. Aldridge had a team-high 28 points, eight rebounds and three assists in 40 minutes in the West finals opener. The 6-foot-11, 260-pounder also earned game highs of 34 points and 12 rebounds when the Spurs eliminated the Rockets sans Leonard in Game 6 of the second-round series. Aldridge is certainly familiar with being the first option from his stellar playing days with the Portland Trail Blazers, but he knows it won’t be easy without Leonard. Having two starters out of the lineup is a daunting challenge for San Antonio. If the Warriors were to take a sigh of relief with Leonard out, it could be a major mistake. There isn’t an NBA team better at stepping up with a star player out than the Spurs. If the Warriors need a reminder, just ask James Harden and the Rockets. Houston was drilled in its season finale without Leonard and Parker in Game 6 and lost Game 5 with Leonard out the entire overtime. However, along with the loss of Parker, San Antonio loses the face of its franchise if Leonard is indeed out. Leonard averaged 25.5 points, 5.8 rebounds, 3.5 assists and 1.8 steals during the regular season. Keep in mind that the Warriors needed a mammoth comeback from 25 points down before winning by just two with Leonard in the locker room the entire fourth quarter. The Warriors also have their own injury concerns as forward Andre Iguodala missed the entire second half with a sore left knee. It’s a safe bet the Warriors have too much respect for Popovich and the Spurs’ five NBA championships since 1999 to take one of the world’s most dominant sports franchises lightly.